SQL Power Wabit just works! Recognizing that end-users struggling with overly-complex BI Tools is the number one reason why Business Intelligence projects fail to deliver the desired ROI, SQL Power Wabit was designed to conquer this primary issue. Although there are many BI Reporting tools on the market (both proprietary and Open Source), most of these tools are fairly difficult to use and require one or more days of training before a user can get started. 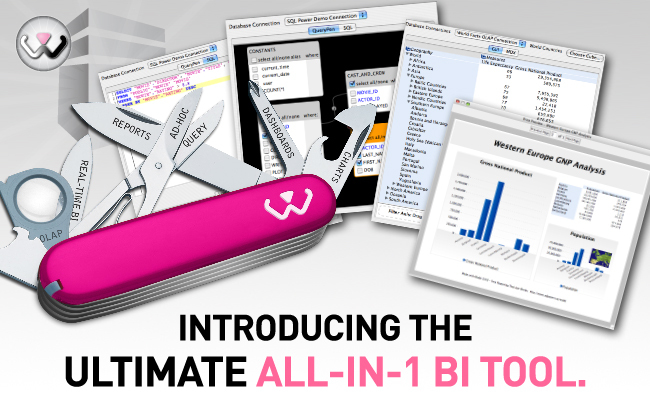 Committed to providing business users around the world with an intuitive BI Tool for everyday data analysis and decision making, SQL Power Wabit designers set out to create the simplest and most intuitive BI Reporting tool on the market. 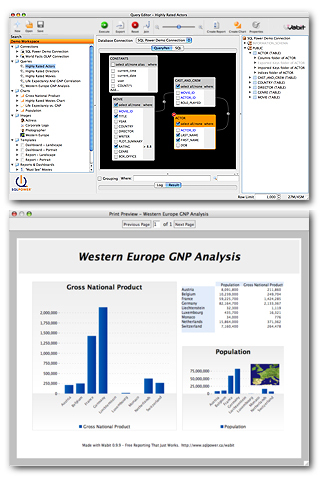 Like other Best Of BI Tools, SQL Power Wabit Business Intelligence Reporting Tool is very elegant and easy to use. Standard Reporting is now easier than ever. With a single mouse click, query results are instantly transformed into elegant reports - which can further be customized with fonts, colours, sections, breaks, headers/footers, logos and more. Download a free copy of SQL Power Wabit today and use it to simplify all your database reporting needs. If you like the tool, all we ask is that you spread the word - tell your friends, colleagues and/or blog it.